Has there ever been that time where you come across a word written in katakana, but then find out that after sounding it out you still have no idea what it means? For those that don’t know, Japanese has three different writing systems: hiragana, katakana, and kanji. This post is about katakana, the syllabary (primarily) used for loan words, called gairaigo, or 外来語 （がいらいご）. This doesn’t include 漢語（かんご）, or kango, which are words that came from China that would use kanji, although many of those words are typically seen spelled now with katakana anyway. As an example, チャーハン or fried rice is a Chinese loan word, and spelled using kanji would read “炒飯”. Katakana is also used in other situations like onomatopoeia, technical terms, some company names like トヨタ (Toyota), while other companies use kanji in their names like 任天堂 (Nintendo). It is also common to see many company names spelled using romanized Japanese. Katakana literally means “fragment kana”, because they were created from components of kanji. Here is a picture courtesy of Wikipedia, showing the 46 current katakana (ヱ and ヰ became obsolete in 1946), and which kanji they were derived from. 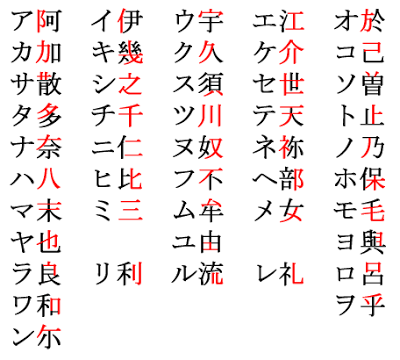 (As a note, hiragana was also created from kanji in the same way). With so many English loan words being used in Japanese and increasing, it could be easy to not think for a moment about the many gairaigo, or loan words, that came from other languages, like Portuguese or German. For example, it was Portuguese traders that first taught Japanese of guns and tobacco, influenced the invention of 天ぷら（てんぷら）or tenpura, and brought Christianity over in the form of Jesuit missionaries. On the German side, Japan started refining their medical technologies with German influence, and as a result there is a lot of medical terminology used in Japanese that originated from German, like ワクチン from ‘Vakzin’ meaning vaccine. If you are learning about medicine in Japanese, knowing German would be helpful. Some popular chemical names that we all know like “caffeine” came to Japanese first from German, which is why the pronunciation of カフェイン is not spelled カフィーン、 like it could have potentially been if the word was brought in from English initially. Having English under our belts is quite an upper hand given how many loan words originated from it. Imagine if you spoke another language where you would still have to learn all the abundant English-derived loan words in Japanese anyway, but did not already have the English background! アンケート、from “enquête”, meaning “questionnaire” in French. アルバイト、from “Arbeit”, meaning “work” in German. In Japanese this means a part time job, and is often shortened to just “バイト”. パン、from “pão”, meaning “bread” in Portuguese. ブランコ、 from “baloiço”, also meaning “swing” in Portuguese. イクラ、from икра (ikra), meaning “caviar” in Russian. There are situations however where a word will come from English, yet many English speaking gaijin (外人, foreigners) might have the tendency to mispronounce a “Japanofied” word because of their excellent English knowledge, where the word does not have the best representation of the way it actually sounds in English. Two strong examples are ニュース (nyu-su) and キャベツ (kyabetsu), meaning “news” and “cabbage”. You might hear a student say: ”ニューズ” (nyu-zu) or ”キャベジ” (kyabeji) instead, because they sounds closer to the English word. There are also times that just because a word was derived from English, that doesn’t necessarily mean you will know what the word is after sounding it out, because it might not carry same meaning as in English. Those types of words are called 和製英語（わせいえいご）, or wasei-eigo, meaning English of Japanese creation. A word like “salary man”,（サラリーマン）, is a good example of high frequency wasei-eigo. Just like wasei-eigo, there is also wasei-kango, or 和製漢語, meaning Japanese-created Chinese words. A few popular examples of wasei-kango words are 煎茶（せんちゃ）, a type of green tea, and 芸者（げいしゃ）, a geisha. ジャストサイズ (just size) — meaning “perfect size”, probably from “just the right size”. フリーサイズ (free size) — meaning “one size fits all”. スタンド (stand) — which can mean “desk lamp”. ベースアップ (base up) — meaning salary increase, because your base (pay) goes up. ストーブ (stove) — meaning heater, (but could possibly also mean stove).